HOUSTON (KTRK) -- The Rockets played with effort and intensity. They ran on offense, and they ran back on defense. In short, they played like they played all season long on the way to a 124--103 Game 5 win over the Clippers. 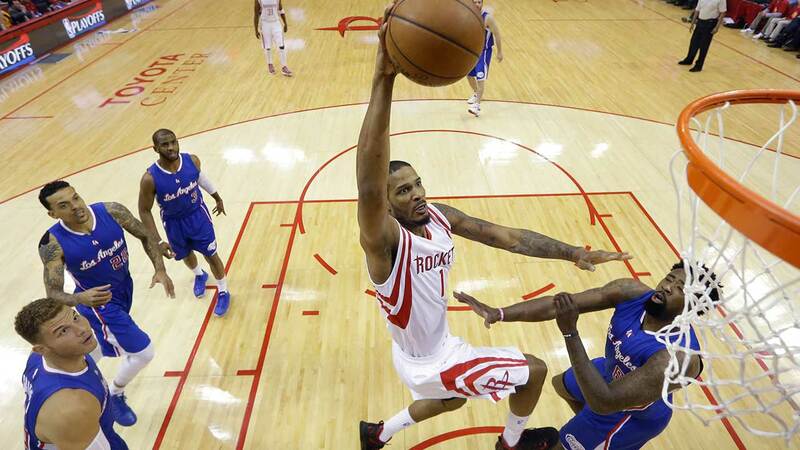 Avoiding elimination, the Rockets send the series back to Los Angeles for Game 6 Thursday. James Harden led the way with 26 points, 11 rebounds and 10 assists despite feeling sick and getting IV fluids in the afternoon. Dwight Howard added 20 points and 15 rebounds. They combined with Jason Terry to key a 15-2 run to close the first half for a 15 point lead, and Kevin McHale's team rolled from there. McHale summed it up, "That was really the first game we played downhill and got our rhythm going. We just had more juice. We rebounded well. They put two on the ball with James and we adjusted. Dwight was huge on the boards." Howard was particularly active early with strong finishes at the rim. His play led the Rockets attack inside on the way to shooting 54 percent as a team. The Rockets center said, "Man, thank God. We live to fight another day. We have to play with pride from now on. We can't go into L.A. with any doubt." Looking ahead to another must-win in Game 6 the Rockets coach said, "Play downhill and attack them. We play better when we play inside out. We've got to put a lot of pressure on the referees. Get in the paint."